Called by God, he went forth out of the desert and into the world, as into single combat against the Devil. For it was not thought just that the one thus honored by God and placed high should disdain the salvation of his fellow men, but remembering the one who said, “Love your neighbor as yourself” [Lk 10:27], who did not disdain to put on the form of a slave, although unchanged, for the salvation of a slave [cf. Phil 2:6ff. ], Symeon imitated his own master and truly used his own soul and body in order to save others. Then one time (some youths) were outside the city playing lysoporta [tr. something like red rover], of whom one was the son of Symeon’s friend, John the deacon, who a few days earlier had fornicated with a married woman. As he was leaving her house, he was possessed by a demon, although no one saw it happen. Therefore the saint wanted both to chasten him and heal him at the same time. And he said to the runners, “Truly, unless you let me play with you, I won’t let you run.” And they began to throw stones at him. They wanted to take him to the side where the one he wished to cure was running. Seeing this, Abba Symeon went off the opposite way instead. For he knew what he was going to do. And when they began to run, the saint rushed headlong toward the possessed boy and overtook him. 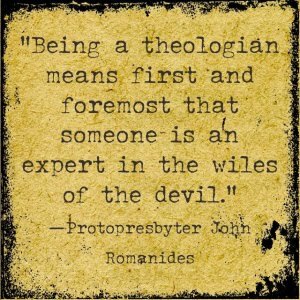 When no one was looking, he punched him in the jaw, and said, “Commit adultery no more, wretch, and the Devil won’t draw near you.” And immediately the demon threw the boy down, and everyone jumped on top of him. As he lay on the ground foaming, the afflicted one saw the Fool chasing a black dog away from him, beating it with a wooden cross. Many hours later, when the youth came to, they asked what happened to him. And he could not say anything except, “Someone said to me, ‘Commit adultery no more.’” Only after Abba Symeon had died in peace, as if coming to his senses, the youth narrated the event carefully. One day while he was in the phouska-seller’s shop he picked up a pandora and began to play in an alleyway, where there was an unclean spirit. He played and spoke the prayer of the great Nikon in order to chase the spirit away from the place, for it had abused many. When the spirit fled, it passed through the phouska-shop in the form of an Ethiopian and broke everything. The amazing Symeon, when he returned, said to his mistress, “Who broke these things?” She said, “An accursed black man came and smashed everything.” He said to her, laughing, “Too bad, too bad.” She said, “Yes, indeed, Fool.” He said to her, “Truly I sent him, so that he would break everything.” When she heard this, she tried to beat him. But ducking down and scooping up a handful of dirt, he threw it in her eyes and blinded her. And the saint said, “Truly, you won’t catch me, but either you will take communion in my church, or the black man will break everything every day.” For they were members of the sect of Acephalic heretics. After he left her, behold the next day at the same hour, the black man came and again smashed everything in sight. In dire straits, they became Orthodox, taking Symeon to be a sorcerer. They did not dare to tell anyone about him, although every day the Fool came by and jeered at them. Once again a demon was haunting another part of town. One day, while he was walking around, the saint saw it trying to strike one of the passersby. And taking stones from his pocket Symeon began to throw them every which way into the marketplace, and he turned back everyone who wanted to go across. At this moment, a dog passed by, and the demon struck it and (the dog) began to foam. Then the saint said to everyone, “Go on now, idiots!” For the all-wise one knew that if someone had gone across, the demon would have struck him instead of the dog. It was for this reason that he stopped them from crossing for a short while. 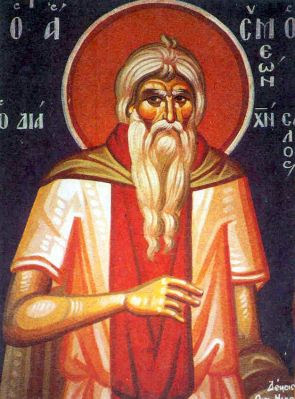 Symeon had extraordinary compassion for those possessed by demons, so that from time to time he went off to make himself like one of them, and passed his time with them, healing many of them through his own prayer, and therefore some daimoniacs cried out and said, “O violence, Fool, you jeer at the whole world. Have you also come by us to give us trouble? Retreat from here; you are not one of us. Why do you torture us all night long and burn us?” While the saint was there (in Emesa), he cried out against many because of the Holy Spirit and reproached thieves and fornicators. Some he faulted, crying that they had not taken communion often, and others he reproached for perjury, so that through his inventiveness he nearly put an end to sinning in the whole city. During this time there was a woman clairvoyant and maker of amulets who performed incantations. The righteous one contrived to have her as a girlfriend and gave her things he had collected from those who gave him presents, whether coins or bread or even clothing. Then one day he said to her, “Do you want me to make you an amulet so that you will never be touched by the evil eye?” And she said to him, “Yes, Fool,” reasoning that although he was a fool, perhaps he would succeed. So he went off and wrote in Syriac on a tablet, “May God render you impotent and stop you from turning his people away from him and toward yourself.” Then he gave it to her, and she wore it. And she was no longer able to make anyone either oracles or amulets.